Too much sitting takes a toll on good health. New materials from Journeyworks inspire activity breaks that can help reduce the risk of chronic disease. There is no easier way to sit less and move more than to get up and take a walk. Many of us sit down all day at work, at school or during our commute. We often even choose to sit during our off-hours to relax in front of the TV or computer. Health experts have recently warned that all this sitting can contribute to health problems like weight gain, high blood pressure, heart disease and type 2 diabetes. The best way to avoid the negative effects of too much sitting is to interrupt the sitting with short activity breaks. Journeyworks Publishing has just released a new pamphlet that focuses on the health risks of too much sitting and gives readers practical tips on how to sit less and move more. Health professionals and educators who are looking for the right materials to reach their clients can request a copy of this new title by visiting Journeyworks Publishing’s Too Much Sitting review pack page. There is no easier way to sit less and move more than to get up and take a walk. For those who may still need convincing, Journeyworks has a ready-made list of great reasons in their pamphlet “I Walk Because ...” This title has long been one of their bestsellers and is a perfect companion to their latest “Too Much Sitting” pamphlet. Organizations looking for health promotion brochures to hand out at health fairs or other events will want to check out these titles. In addition to the colorful and easy-to-read pamphlets, Journeyworks has also just released an “I’ll Walk Today! One Step at A Time” wristband. This wearable reminder can inspire individuals and those around them to stand up for better health and add active breaks to their day. 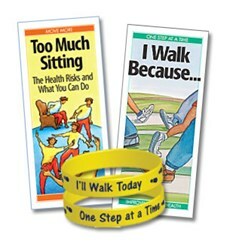 To request samples of all of these health promotion materials visit Journeyworks Publishing’s Too Much Sitting review pack page. Journeyworks Publishing is a national health education and health promotion publisher with more than 10,000,000 pamphlets, brochures, booklets, posters, bookmarks, videos, digital pamphlets and other products distributed each year. Used extensively by public health departments, hospitals, schools, VA programs and more, Journeyworks materials are known for being creative, effective, easy-to-read and accurate. You can learn more by visiting http://www.journeyworks.com.